The HTC One SV follows in the design and performance footsteps of the entire One line from HTC. It was clearly born in HTC's design labs and has all the hallmark features that make an HTC device an HTC device. 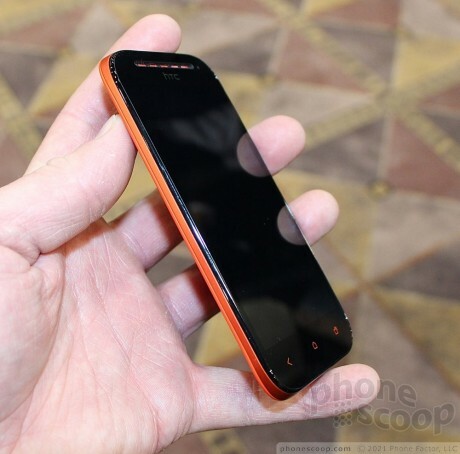 For starters, it has a polycarbonate body, though it's not a unibody like the One X. It is made of separate pieces (back, sides, front). The materials have just a slight bit of grip to the, much in the way the 8X does. The glass front is entirely black, broken up only by the red capacitive buttons below the display and the red-colored earpiece grill above it. It's a good look. Overall, I find the design to be very appealing. I really like the look, even if the red is bordering on orange. The feel in the hand is quite good. It is a deceptively thin smartphone and fits snugly in your palm when gripped tightly. I really like the weight, it barely registers when in your pocket it is so light. The buttons are perhaps the best I've used on an HTC device in recent memory. Not only is the volume toggle easy to find and use, but it has excellent travel and feedback when pressed. Same goes for the power/screen lock button on top. THe headphone port is on top and the microUSB port is on the bottom. The One SV has a removable back cover and a removable battery. This is becoming an uncommon feature for HTC devices. The materials, combined with the good looks make the SV a really attractive device — especially for Cricket's customers. The user interface is of course the same old Sense 4.0 running on top of Android 4.0 Ice Cream Sandwich. Aside from the presence of Cricket's Muve Music app and several other Cricket-branded services, you'd never know it was for Cricket. The performance of the user interface was speedy across the board. I gave it a good work out, and even though it was running pre-retail software it was flawless in terms of speed and agility. The One SV has a really good prie — $349 — and does not require a contract. Cricket customers are getting a lot for their money with this phone. According to documents seen on the Federal Communications Commission web site, the HTC One SV may soon be sold by Sprint. The FCC recently approved an HTC device with the model number PL80110. Gallery is showing as empty when I click the picture from the front page.